Is your hair in need of some extra volume and an eye-catching glow? Then TIGI Bed Head’s new Motor Mouth is the perfect volumizer for you! Not only does it make your hair look fuller and smoother, it also lights up under UV light! With the addition of some high-quality volume boosters and conditioners, this fixative thickifier will create great body and volume for thicker hair that’s easier to manage during blow drying. It contains Tinopal, an optical brightener that absorbs and reflects UV light, treating your hair to a spectacular glow. The product is lightly scented with a fruity blueberry muffin fragrance, ensuring your hair not only looks thicker and smoother, but also smells marvellous! 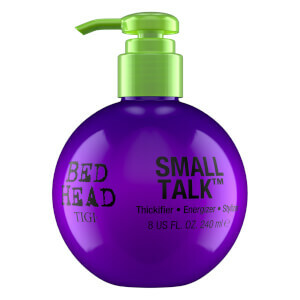 TIGI Bed Head Motor Mouth is stylishly presented in a round, yellow bottle with a purple pump for a bright and colourful addition to your daily grooming routine. – N.P. Use 2-3 pumps on wet hair. Blow dry and style as desired. For UV glow, apply product liberally to individual sections of hair.